We are Wales’ leading charity for people with serious mental illness and their carers. 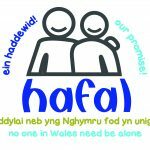 Covering all areas of Wales, Hafal is an organisation managed by the people we support: individuals whose lives have been affected by serious mental illness. Hafal's Recovery Programme is a modern approach to dealing with mental illness and encourages you to take a "Whole Person" approach to your life. You can support our work by becoming a Member, volunteering, or by donating or leaving a gift to Hafal. Hafal operates in all of the following 22 local authority/Health Board areas across Wales. Find out about the services available locally to you in your area.